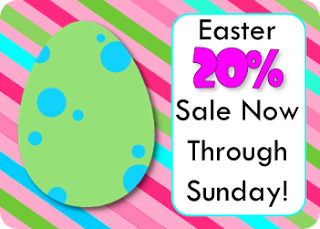 Easter Weekend Sale at FlapJack! Happy Easter weekend! I hope you have a great time with friends and family and can relax a little bit! So, in order to celebrate, I’m having a 20% off sale through Sunday! Some of my bestsellers include Kindergarten Smart Board Pack, Kinders Give a Hoot Owl Worksheet Pack, 3rd Grade Smart Board Pack, 4th Grade Smart Board Pack, QR Code Math Bundle Fun (2nd-3rd), Telling Time Lapbook, Fractions Poke Game Bundle, Spanish Lapbook Bundle, and Math Operations QR Code Bundle. And this would be a great time to grab a Classroom Materials Pack for the upcoming year! Designs available – Owl, Monster, Beach/Ocean, Safari/Jungle, Rainbow. To visit my store, click the image below. All titles are also 20% at my Teachers Notebook store, too!